The position that you ride a motorcycle on a road will affect your safety, the safety of other road users and traffic flow. Good road positioning is typically the result of lane discipline. In general, for Great Britain keep to the left side of the road and in the centre of your lane. 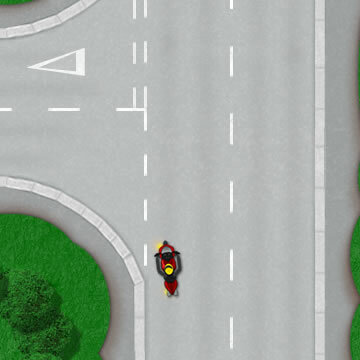 Though riding in the centre of your lane is not always possible, it is advised as a form of defensive riding which involves techniques to spot hazards at an early stage and reduce dangers. Riding too far the left of your lane in the gutter, increases the potential for hitting kerbs, hitting potholes, loose debris and may otherwise encourage motorists to overtake (if this is not your intention) whilst leaving you with little room in between the overtaking vehicle and the verge. Riding in the centre of the road will generally provide the safest position, though the key is to be flexible. Read the road, look ahead, plan and anticipate changes and adapt your road position for each situation. Motorcycles are not always easily seen by other road users. Choose a road position that allows you to be seen by oncoming vehicles and in the mirrors of the vehicle in front. Riding too close to the vehicle in front gives little time to change direction or speed and obstructs your view of the road ahead. An oncoming vehicle may need to enter your lane to overtake for example. Remaining a safe distance from the vehicle in front provides a better view of the road ahead. When you need to change road position, use the Observation – Signal – Manoeuvre / Position – Speed – Look routine. 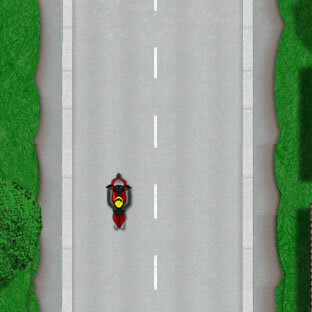 When making left turns or turning left at a junction, position the motorcycle to the left of your lane. Approximately one and a half feet (45 cm) as you approach and round the corner is as safe road position. Be wary of loose debris and potholes, often situated in this area. Whilst following the road straight ahead, a general safe road position is in the centre of your lane as this keeps a safe distance from oncoming vehicles (right-side of your lane) and keeps you out of the gutter (left-side of your lane) where debris and potholes may be present. Anticipate and plan ahead as you may need to alter your road position due to obstacles in the road such as parked cars, roadworks, manhole covers or oil spills. 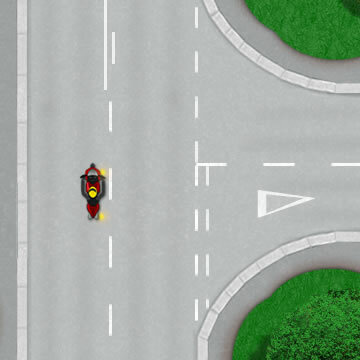 When making right turns or turning right at a junction, position your motorcycle to the right-side of your lane. Keep as far to the right of your lane as safely possible. This will usually be approximately one and a half feet (45 cm) from the centre line. Positioning too far right may put you in a hazardous position from oncoming vehicles.